The Central Business District wore a deserted look with all malls, showrooms and shops remaining closed for the day. 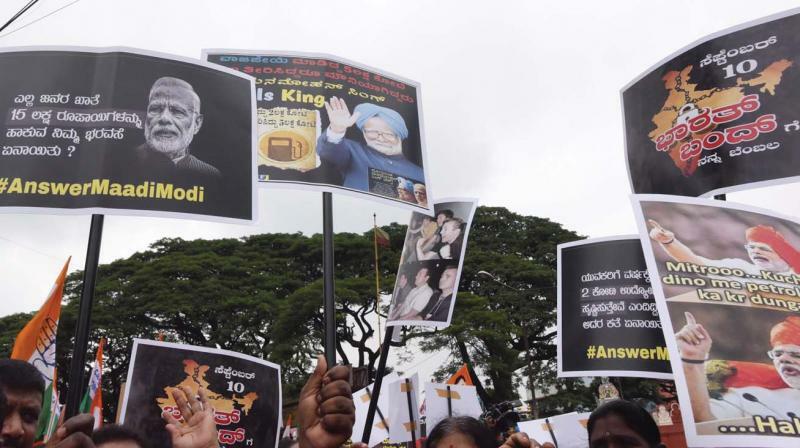 Bengaluru: The Bharat Bandh call given by the Congress and supported by other political parties in protest against the increase in fuel prices threw normal life out of gear in Bengaluru on Monday. State-run buses, private cabs and most of the autorickshaws were off the road till 3 pm and most of the business establishments too were closed. The Central Business District wore a deserted look with all malls, showrooms and shops remaining closed for the day. The empty roads saw bike rallies from the supporters of the ruling coalition, Congress and JD(S), and workers of Left parties. Other outfits too joined the rallies, raising slogans against the Central government against the fuel price increase. till 3 pm, people headed to Indira Canteens for breakfast and lunch. A massive traffic jam was reported on the Kempegowda International Airport as a large number of vehicles were headed to the airport. The advisory by airport authorities that passengers should report at the airport four hours earlier saw a large number of vehicles moving on the Airport road leading to traffic jams.